The Black-crowned Night-Heron is a medium sized wading bird (length 58 to 66 cm) of stocky build, with a relatively large head, and fairly short neck and legs. Males and females are similar in plumage, with the males of slightly larger size. The adults are dominated by gray plumage, complete with black crown, black bill, and yellow to yellow-green legs. The eye, which start out as a grayish-olive at hatching, quickly turn to light yellow, bright yellow, orange, and finally to bright red by 2 to 3 years of age (Davis 1993). During the breeding season, adults also have long white occipital plumes (average of 2 to 3) extending from the distinctly black crown (Davis 1993, Sibley 2000). Juveniles have broad streaks of light brown-over-white on the breast and the wing coverts are covered in large, white spots. They lack the gray, black, and white plumage distinctive in the adults (Sibley 2000). The common call of the Black-crowned Night-Heron includes a "Qua, Quak, Quark" or "Squawk," on the part of adults. An advertising call, identified as a hissing "Plup", is given from the nest, while the common call is given in flight or while perching (Davis 1993). The vocalization of the young varies as the birds age, from newly hatched to grown young, from a "Pip, Pip, Pip" to a "Chuck, Chuck-a-chuck, Chuck, Chuck" (Davis 1993). The distinctive black crown and back, in addition to the gray body and yellow legs, make it hard to confuse this species with any other found in the state. The species to which it is most similar in appearance is the Yellow-crowned Night-Heron (Nyctanassa violacea), but this species lacks a black back, has a bold head pattern with a white cheek patch, and is very rare in Montana, having been recorded on only three occasions (Montana Bird Distribution Committee 2012). Young Black-crowned Night-Herons may sometimes be confused with American Bittern (Botaurus lentiginosus), but the American Bittern has a long, conspicuous mark on the side of the neck, bold stripes on the breast, dark flight feathers compared to the rest of the back, and lacks the large, pale spots on the underparts (Davis 1993, Sibley 2000). 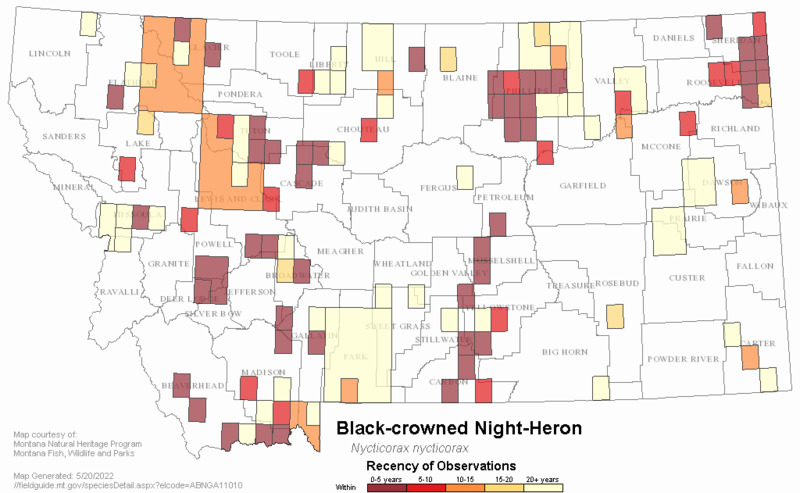 The earliest records for Montana indicate arrival in April, with sightings throughout the summer months and extending into September, when most of the individuals begin their southerly movement (Johnsgard 1992, Montana Bird Distribution Committee 2012). In 2000, one individual was found in the Chester area that stayed until October (Montana Bird Distribution Committee 2012). Although highly adaptable to a variety of habitats, the Black-crowed Night-Heron is likely to use shallow bulrush (Scirpus spp.) or cattail (Typha spp.) marshes, most often within a grassland landscape (Johnsgard 1992). In addition, they will also nest in cottonwoods, willows, or other wetland vegetation that allows them to nest over water or on islands that may afford them protection from mammalian predators (Davis 1993, Casey 2000). Most colonies are located in large wetland complexes, typically with a one-to-one ratio of open water and emergent vegetation (Davis 1993). In general, Black-crowned Night-Herons are found in marshes, swamps, wooded streams, mangroves, shores of lakes, ponds, lagoons, in salt water, brackish, and freshwater areas. Foraging habitat is typically in the shallow, vegetated edges of these ponds, lakes, creeks, and marshes. This heron roosts by day in mangroves or swampy woodland. Eggs are laid in a platform nest in groves of trees near coastal marshes or on marine islands, swamps, marsh vegetation, clumps of grass on dry ground, orchards, and in many other locations. Nesting usually occurs in the same locality with other heron species. This heron feeds opportunistically on small animals, usually fishes, amphibians, and invertebrates obtained in shallow water, but will also prey on small mammals and young birds on land. Aptly named, the large-eyed Black-crowned Night-Heron is crepuscular, hunting at dusk when it is generally too dark for other herons to catch prey. A gregarious species, the Black-crowned Night-Heron's earlier arrival to the breeding territories than other herons, in combination with its nocturnal hunting behavior, may lesson competition with other species within the nesting colonies (Davis 1993). 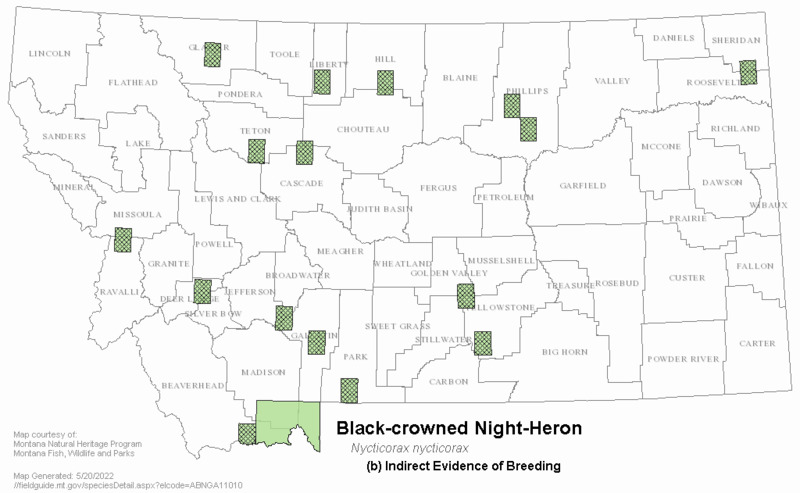 In Montana, breeding activities have been observed in May, June, and July. Preferring similar marsh habitat and possibly gaining protection from predators by nesting in a shared colony, Black-crowned Night-Herons often nest in close association with White-faced Ibis (Plegadis chihi) and Franklin's Gull (Larus pipixcan) (Davis 1993). Additionally, they have also been found to nest in colonies amidst Great Blue Herons (Casey 2000). 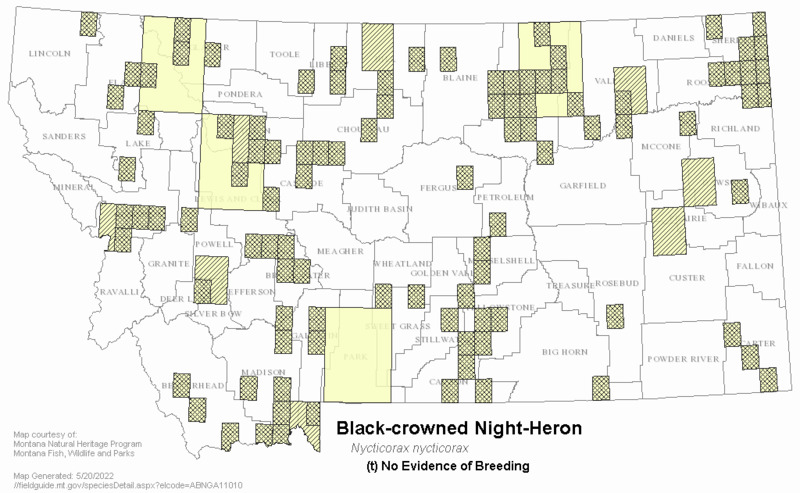 With up to 30 known active nests in some years, Bowdoin National Wildlife Refuge has the largest recorded colony of breeding Black-crowned Night-Herons in the state (Montana Bird Distribution Committee 2012). 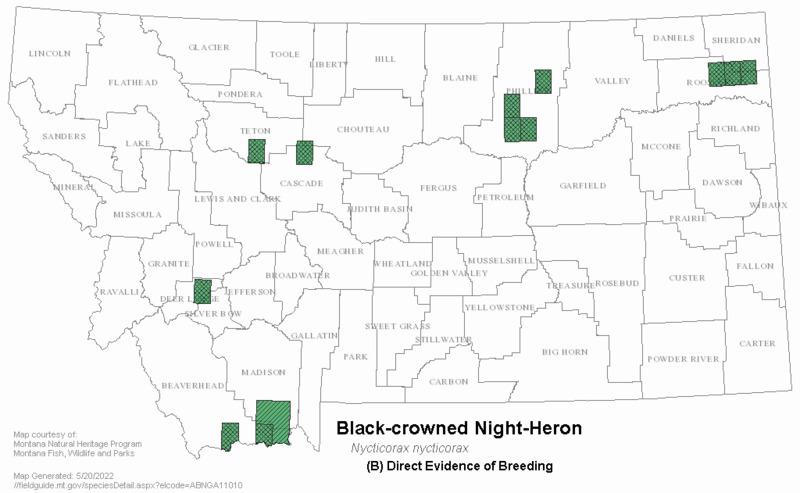 In general, the breeding season of this colonially nesting species varies geographically, occurring in spring to early summer in the northern portions of the range, and earlier further south. 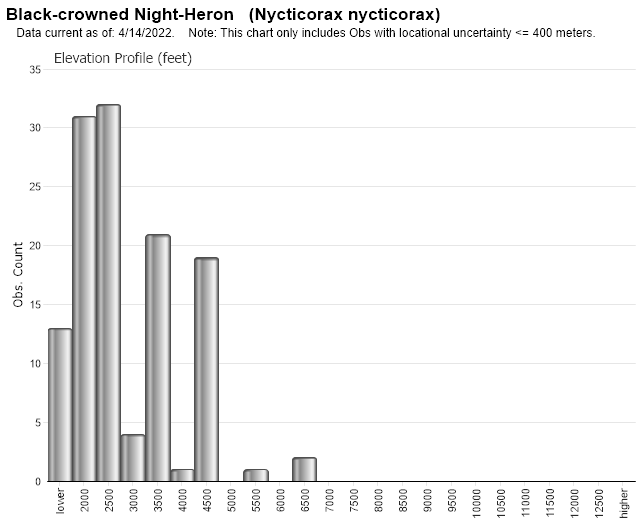 The nest sites are highly variable, from the ground to 160 feet high in trees (Davis 1993). The substrate may be anything from box elder or willows to cattails. Nests in trees may be located just about anywhere on the branches in relation to the trunk, and are composed of a platform of sticks, twigs, or reeds or whatever other material is nearby. Nests in cattails may be constructed on floating vegetation supported by adjacent stalks (Davis 1993). The average clutch of elliptical to subelliptical pale, greenish-blue eggs is usually three to five. The eggs are smooth and non-glossy, 53x37 mm in size (Baicich and Harrison 2005). The eggs are laid asynchronously and hatch generally in the same manner (Davis 1993). Incubation, performed by both sexes, lasts approximately 24 to 26 days. Young are tended by both sexes, and are capable of flight at about 42 days. The age of first breeding is usually at 2 to 3 years. This species nests in small to large colonies. See Custer et al. (1983) for data on certain Atlantic coast colonies. Maintaining habitat integrity (appropriate water levels, and areas free from high levels of predation and harassment) at known nest locations is critical to their continued use (Casey 2000). No specific management actions have been identified for Black-crowned Night-Heron in Montana, but like many wetland dependent species, management of water resources that provide for natural seasonal water levels is essential for maintaining appropriate nesting sites (Davis 1993, Casey 2000). Greedwood, R.J. 1981. Observations on Black-crowned Night Heron breeding success in a North Dakota marsh. Can Field-Nat. 95:465-467. Hancock, J. and J. Kushlan. 1984. The herons handbook. Croom Helm, Ltd., Kentucky. Hoefler, J. E. 1979. Status and distribution of Black-crowned Night Herons in Wisconsin. Proceedings Colonial Waterbird Group 3:75-84. Lokemoen, J.T. 1979. 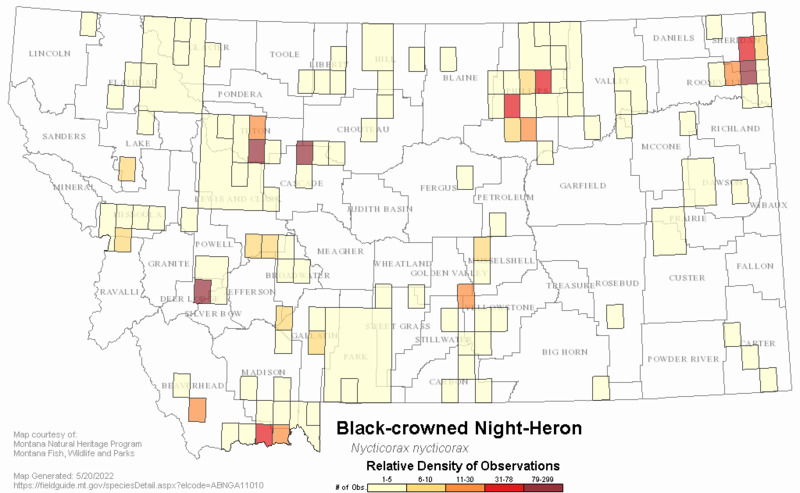 The status of herons, egrets, and ibises in North Dakota. Prairie Nat. 11(4): 97-110. Nickell, W. P. 1966. The nesting of the Black-crowned Night Heron and its associates. Jack-Pine Warbler 44:130-139. Wolford, J.W. and D.A. Boag. 1971. 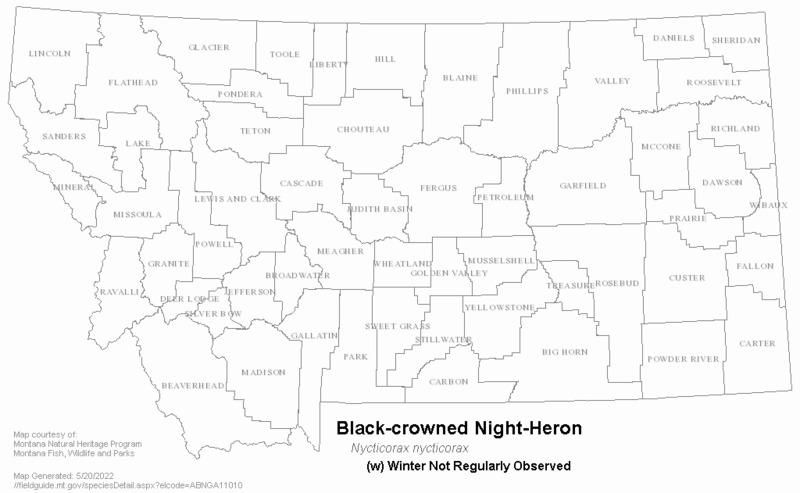 Distribution and biology of Black-crowned Night Herons in Alberta. Can. Field-Nat. 85: 13-19. Web Search Engines for Articles on "Black-crowned Night-Heron"